I love Rhubarb. 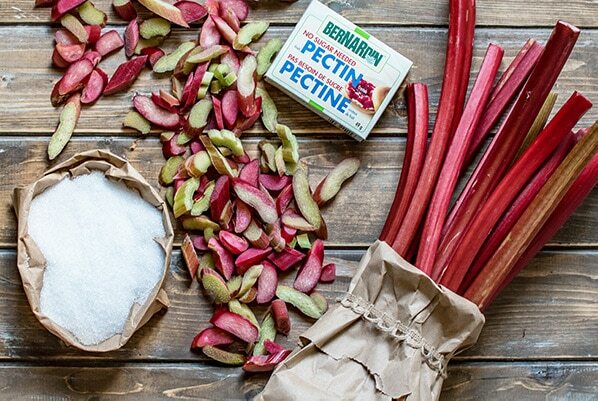 Rhubarb ANYTHING – I will eat it. I especially love rhubarb jam. I process a lot of garden surplus over the summer and put away as much fresh fruit and vegetables as I can. 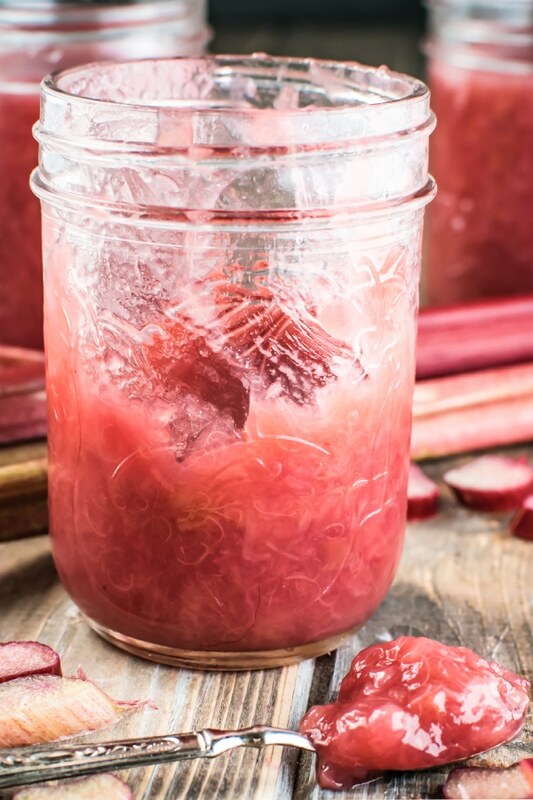 The one thing I cannot get enough of and always seem to run out of is rhubarb. The mid-winter rhubarb shortage is likely due to my unquenchable appetite for it. BUT my challenge with rhubarb is its zing. To make it edible, you have to add sugar or sweeten it to make it palatable. Add sugar to rhubarb, and something magical happens, don’t add the sugar and you might as well lick a lemon. But what if you’re cutting down on sugar, or trying to eliminate carbs? That’s what we’re doing this summer, and I tell you when the realization occurred to me that I couldn’t make rhubarb jam this year I almost had a meltdown. So I set out to make the best sugar-free rhubarb jam I could make. Four tests and twelve jars of jam later I nailed it. There are two issues when you make sugar free jam. The first one is the texture. I cannot eat a runny jam, and I cannot stand a jam that is chewy. The jam has to have a nice gooey, jammy texture or it’s just not right, and I have no interest. Working with sugar-free pectins is a hit or miss in this territory. The second one is taste. I cannot STAND sugar alcohols on their own, erythritol and xylitol’s cooling effect is a real put off for me. Sugar Twin has ruined more than one cup of coffee in my life, and Splenda does have a terrible aftertaste when added to the high heat. Don’t even get me started on how terrible stevia is….. If you love stevia, you keep loving stevia – you weirdo. How to get the jam texture right. I wanted a jam that was smooth without hard bits of rhubarb. 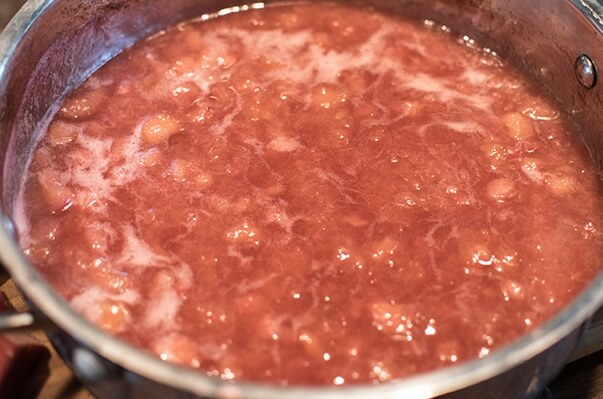 To get the texture right, I precooked my rhubarb until it was tender and I could squash it with the back of a spoon. I also used sugar-free pectin. The box tells you to cook it for 3 minutes and then process in a canning bath. NOPE! When I follow the box instructions, I get a jam that is far too thick and chewy. I only cook my jam for 2 minutes, and I skipped the canning bath method altogether. I’m such a rebel. My method of making sugar-free jam cooks the pectin to a stage where it creates an oooie, gooey, sticky, jammy jam that has the perfect texture. The caveat here is if you only cook your pectin for 2 minutes and you do not water bath your jars, your jam is not shelf stable. Remember, even if you hear the pop of a sealed jar, it does not mean that processed jar is shelf stable. I use Splenda in my coffee and have for years. I also add it when something needs a bit of a sweet kick, like a smoothie. But I don’t like to add it to high heat. Splenda’s big claim is that you can bake with it, and while this is true, I find I don’t like the taste after Splenda is heated. I also have xylitol and erythritol, and I find they both have that cooling sensation. I don’t particularly like either one which is why I still have both kicking around my pantry. So in the spirit of experiment, I made three different batches one each with Splenda, Xylitol, and Erythritol. Spenda was ok. It wasn’t great, still had a weird aftertaste. Erythritol was ok too; it had only a touch of that weird mouth cooling sensation. The xylitol tasted the best but was still too high in net carbs to be worth effort, so I experimented further. The 4th batch and the winning batch was a blend of Splenda and erythritol. For whatever reason, blending the two sweeteners had a significant impact on both the aftertaste and the cooling effect. This amount of sweetener still makes a very tart, lip puckering, rhubarb jam. You can add more sweeteners if you want it sweeter. I would add erythritol and Splenda at a 2:1 ratio. Four clean and sterilized 250ml (1 cup) mason jars with canning lids. Each tablespoon of jam has less than one net carb and six calories. Seriously I had to go double check that math because it didn’t seem right, but I put the ingredients in twice and checked my math three times. 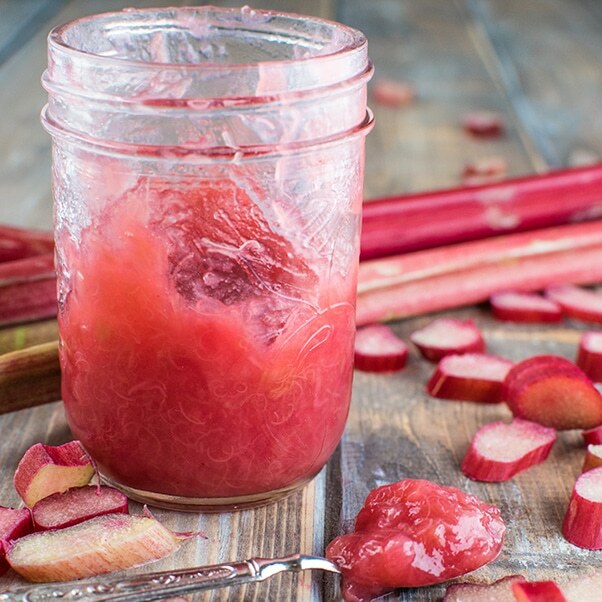 Rhubarb is naturally low in calories and carbs- it’s a perfect addition to a low car diet. 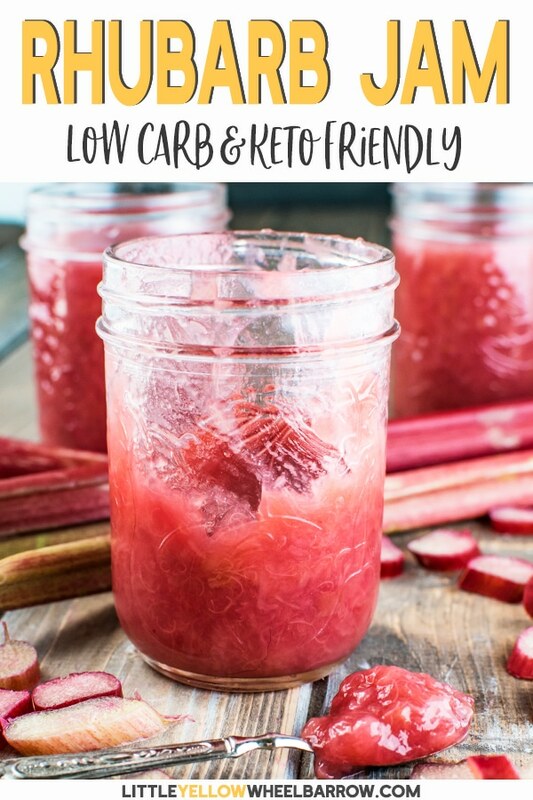 Cooked rhubarb, without any additions, only has 50 calories per cup and 6.7 grams of net carbs. 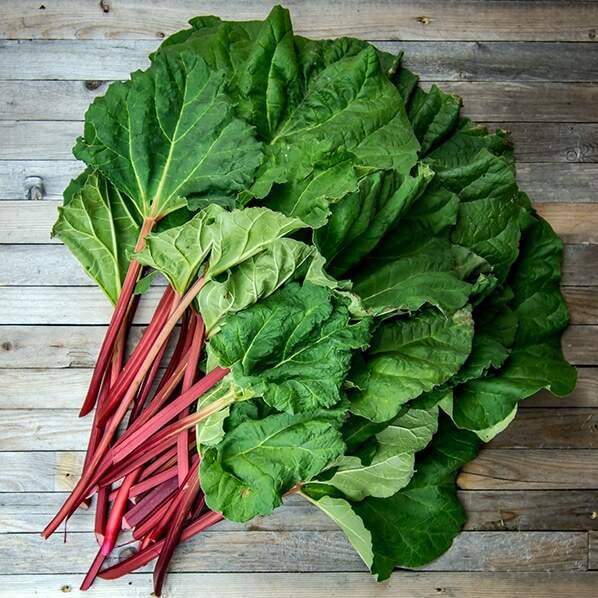 Add 6 cups of chopped rhubarb to a pot with 1/2 cup of water. 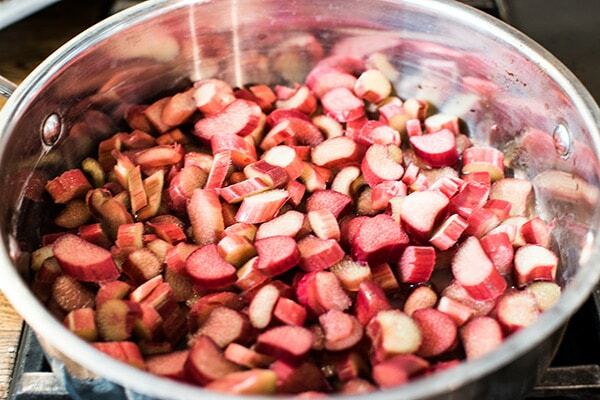 Cook it down until you can smash the rhubarb with the back of a spoon. Once your rhubarb reaches this stage, smush it all and take it off the heat. It only took my rhubarb 3 minutes on medium-high heat. 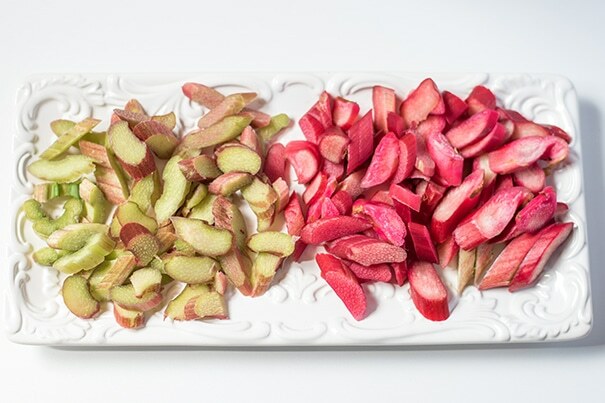 Measure out your crushed rhubarb to make sure you have 4 cups and put it back in the pan. Add your 1 cup of Erythritol and 1/2 cup of Splenda and the pat of butter. Put the pan back on the heat and bring to a rolling boil. 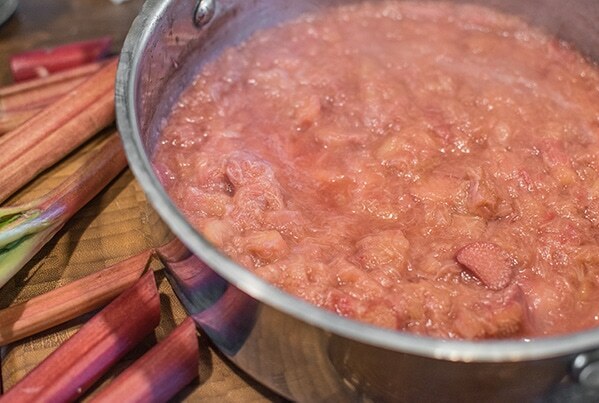 Add the pectin when your rhubarb is at a rolling boil and start a timer for 2 minutes. When the timer stops, remove from the heat. Step 4: bottling your beautiful sugar-free rhubarb jam. 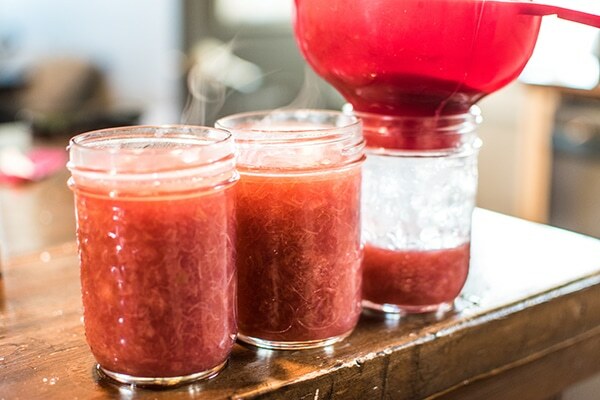 Use a jar funnel (these things make filling canning jars a breeze) and a ladle and fill your sterilized mason jars. 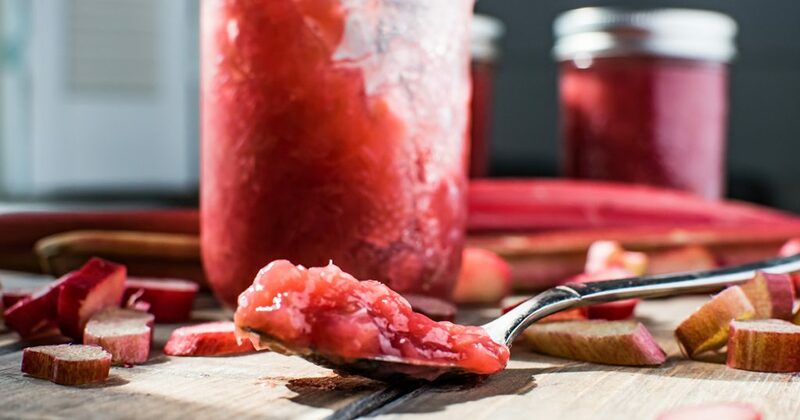 This recipe made exactly 4 cups of rhubarb jam. 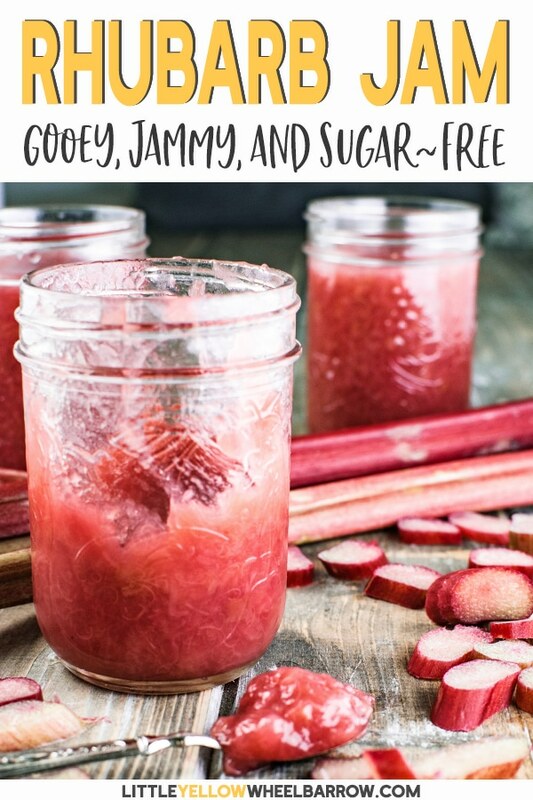 Oh and here is a tip – if you want a pretty jam only use the pink rhubarb if you use the green your jam will have a duller more muddy water color. 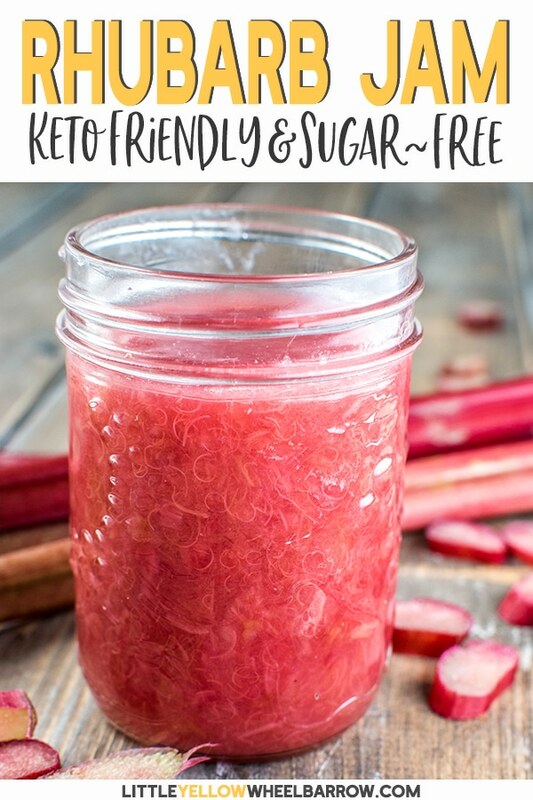 For bright pink jam, like the jars in my photos, use the pink stuff and save the green for another recipe. Add the lids and set aside to cool. Once your jars are cool, you can put them in the fridge, or toss in the freezer for a later date. Or eat half of one as I did… see my spoon. I didn’t even put the jam on anything I just ate it like an animal. If you’re not eating carbs, what do you do with your jam? The thing I miss the most when I am avoiding carbs is bread. Not loaf bread, but a good slice of homemade bread toasted, or a fresh scone out of the oven. These are the typical things you spread jam on… so if you’re not eating bread why do you need jam? Well, I like to smear a tablespoon on low carb pancakes or waffles. The Rhubarb jam also tastes fantastic on top of a mini low carb cheesecake. It’s a tart addition to add to homemade BBQ sauce – no seriously, rhubarb BBQ sauce is a THING. The jam also makes a tasty topping for sugar-free ice cream. If you’re cutting sugar and carbs, it’s good to have a few of your favorite items made with less sugar, so you don’t feel deprived. Just don’t do what I did and eat half the jar all at once. Have you tried making it with stevia? Hi Sue, I actually talk about Stevia in the article. I cannot tolerate Stevia, even in small doses, so I never cook with it.